From farmers to poultry hobbyists, they welcome incubators that can be used by anyone with no great technical complication. The Brinsea Mini II Advance is a fine example in this regard. From its aesthetic design to a compact standing space and practical features, this incubator is a common favorite among new and established incubator enthusiasts and professionals looking to hatch healthy chicks and ducklings. Capable of hatching all the eggs you place inside the incubator chamber, you can perform successful hatching with no duds or cracking circumstances. Everyday people have conducted tests and more than three consecutive hatchings have resulted in a 100% success rate. People who ordered a handful of shipped fertile eggs also saw marked success. In a match-up between shipped eggs and incubators, a 50-60% hatch rate is considered normal. However, with the Brinsea Mini II Advance Hatching Egg Incubator, all the eggs were shown to hatch into healthy little ducklings and chicks. Each of the seven or so ducks eggs or chicken eggs that you place on the incubator tray are automatically turned thanks to a smart technological addition comprising rotating egg disks. There are two types of these disks available… One comes ready to deal with 7 eggs of all sizes including duck (supplied as standard). Another slightly smaller egg disk comes capable of holding 12 eggs including pheasant (this is available as an option). No half turns or other angles are possible, the eggs are turned fully to the other side as needed, increasing incubator balance and chance of hatching success. Two days before the moment of hatching, the Brinsea Mini II Advance initiates its auto stop feature that keeps eggs from turning. This way chicks or ducklings can find the hatching process easier, not to mention that embryo health is encouraged through this. As high quality low cost egg incubators go, this product is quite the catch. You will find incredible flexibility where this incubator is concerned. For instance, instead of using paper towels you can cut felt to size after you have taken the turning plate out first. Not only can the felt be washed it is also far more durable than paper towels. Another outstanding alternative are rubberized shelf papers that offer better traction than paper towels. The Brinsea Mini II Advance Incubator is quite adaptable compared to other egg incubators in the same product type and range. Date-of-hatch countdowns are one of this incubator’s exceptional smart-features. A crisp digital display shows temperature alarms and periodic cooling times. This helps customers keep track of what is going on inside the incubator and to keep regular tabs on the status of the eggs. Armed with a fan-assisted design and amazing airflow specs, the Brinsea Mini II Advance evenly heats all eggs inside the chamber. The fan works consistently to promote oxygen flow throughout the incubator chamber. The transparent lid makes for easy 360-degree viewing of the eggs on the tray inside the incubator. The lid does not even need to be lifted to check up on the eggs. You can see how well the eggs are turned by the automatic turner disk mechanism. Thanks to even heating and proper fan-based ventilation, you will never see fogging on the inside lid . Central water reservoirs supply all the humidity required for the Brinsea Mini II Advance. Energy is saved thanks to their low voltage required performance capabilities. Safety is promoted thanks to the main adapters also supplied with the product. Ideal humidity is key to hatching healthy ducklings and chicks, and with this Brinsea model you can rest easy knowing that humidity is top notch, especially now with the convenient external top-up. Depending on the egg species you have selected to hatch, you can program the duration of incubation using the micro controller. You can also use it to alter the temperature and egg turning. You need to top it up with water periodically. This may be a normal and expected feature in incubators and it is made easier with the convenient external top-up. A hygienic ABS construction makes for easy cleaning but if you use strong cleaning fluids or detergents, they stain the material. There have been some instances when the heating unit and sensor have given trouble a few days before hatching date. Superb airflow and balanced ventilation promote even heating in the incubation chamber. 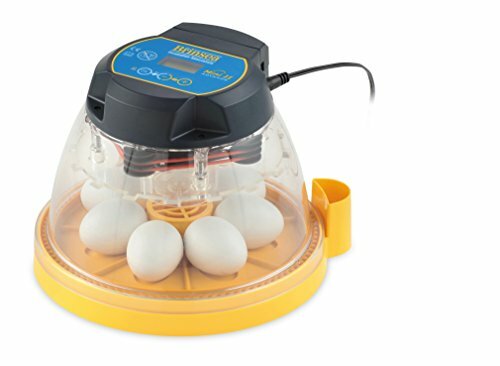 One of the most adaptable egg incubators on the market, the Brinsea Mini II Advance has automatic stopping and egg turning features that add to the product’s convenience. which way is the fan blowing the air? We took apart to clean and need to replace the fan correctly. tajhizyar on How to Choose the Right Incubator and Eggs for Hatching? Chickeneggsdiy.com is a participant in the Amazon Services LLC Associates Program, an affiliate advertising program designed to provide a means for sites to earn advertising fees by advertising and linking to amazon.com, amazon.co.uk, amazon.ca and any other website that may be affiliated with Amazon Service LLC Associates Program.